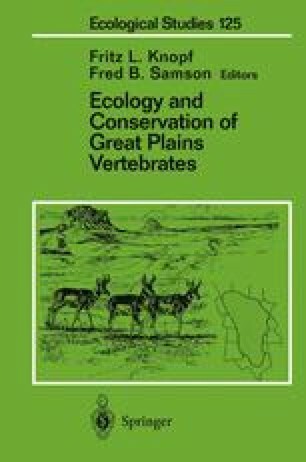 The defining period of coevolution among Great Plains plant and ungulate species occurred during the past 12,000 years (Mack and Thompson 1982, Axelrod 1985). In the late Pleistocene and early Holocene, a diverse array of large grazers and browsers were reduced to a much smaller group of ungulate species represented by bison (Bison bison), pronghorn (Antilocapra americana), deer (Odocoileus hemionus and O. virginianus), and elk (Cervus canadensis). These changes occurred in the presence of nomadic humans from the Asian steppe who were immigrating to the Great Plains during the same time. The landscape was characterized by gently rolling interfluvial surfaces covered with perennial herbaceous vegetation. These exposed grasslands were periodically interrupted by more protected wetland, riparian woodland, or scarp woodland habitats. Although wetlands and woodlands occupied less than 7 and less than 3% of the Great Plains, respectively (National Wetlands Inventory, and Nebraska Natural Heritage Program data bases), the heterogeneity that they created at landscape scales played a major role in determining the distribution and abundance of native ungulates. Extreme cold and heat, drought, flood, fire, wind, and countless biotic interactions caused locally short-term fluctuations in ungulate populations and long-term shifts in landscape features. These dynamic temporal changes were overlayed on a multi-scale spatial mosaic. Native ungulates were adapted to this landscape.